Having a feeling of déjà-vu here? That’s perfectly possible! I’m pretty much wearing exactly the same in this outfitpost. I guess I wasn’t really paying attention when I got dressed, oops. Today is my lazy day. I’m going to clean my iTunes library, check if everything is ready for sunday, read some magazines and think about a concept for my blog. It’s a big mess here isn’t it? I’d like your opinions too! What do you guys want to see and read more often? What are you interested in? The sweater makes it different. so jealous you get to wear that already … it is so hot here still, but its a great lazy day ensemble. Very anthropologie! Such a pleasant outfit, it's very cute. And I always like to read some beauty product reviews, and maybe some music as well! It's nice to see different sides of a blogger, outside of fashion. I repeat my outfits all the time, too. Good look redesigning your blog- it looks amazing already!! Mustard looks perfect on you! thank you for visit me, and appreciate my blog. If you like it, please follow me, if you can! for me it’s important! Thanks for commening on my blog, I've fallen in love with yours! I love your style, and just from looking through a few of your posts I can see you always choose amazing backgrounds! the shirt + knitted top = very yummi! hey nikki! I love the mustard knit and your whole outift…i'm inspired to try this look..if the heat ever goes away! i'm interested in alot of stuff, i think everyone has his own tastes. you should post whatever you like, make this your own space! i'm so jealous of your hair, its adorable! i love mustard. just got my mustard cardigan i wanted! i love when you post your outfits. and your travels. and anything mostly. I love how this sweater matches your amazing hair! so lovely! You look amazing in that special knitted top,the color is perfect..I bet you have the superb feeling on it.Plus your shining eyes with the amazing background and the most pretty smiles,you are terrific..
adorable look – i love mustard for fall! Such a great look, love the mustard. Loving the colours, darling! I miss mustard from my wardrobe! Die kleur van je trui is echt zo mooi, ik heb er ook een trui van! Vind de tweede foto echt heel leuk, heel schattig eigenlijk haha! Cute outfit I love the sweater! I love your blog. Come check out mine too! nice sweater :)! ik vind die "mess" wel meevallen! Vind je blog altijd erg leuk om te lezen! I love mustard. Actually only this year I start liking and wearing different shades of yellow, which can be so chic. I really like this outfit and the details like the rose ring are so cute. I really love this version of the outfit better. I think it's the mustard sweater over the denim and the fact that I can't wait for it to get a bit cooler out here. 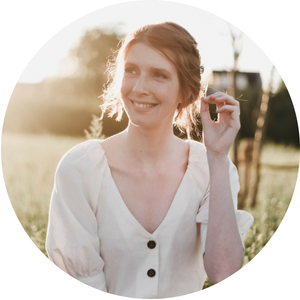 I only needed to see one picture and I immediately fell in love with your blog! Fabulous outfit. I'm your newest follower! Beautiful outfit, lovely for the near approaching autumn! This might be my new favorite outfit on you! So pretty I love the sweater with a collard shirt underneath and a belt on top! I just clean my itunes library, it feels so much better! You look stunning! the color of the sweater is gorgeous as well as the ring! I really love the sweater over the denim shirt! Very cute outfit. Love it paired with that denim chambray…I just thrifted this gorgeous mustard cable knit, will definitely have to rock it this way come Fall! Thanks for leaving me such sweet comments, hope to see you back again soon! gosh i love your red hair! i always wanted to dye it when i was little, and paint freckles on myself. love the whole color palette of ur outfit! beautiful color of the sweater!! Love how you layered and belted this sweater! 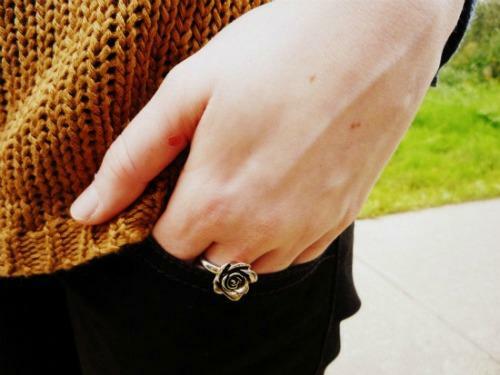 That little rose ring is so sweet! Casual yet chic!! !You look great! I love mustard and this knit is just gorgeous. I think I need one just like it! you are really good at putting outfits together! looove the mustard and the shoes. love. I think mustard is becoming my favorite color, it looks lovely on you! just found your blog today! I'm a new follower!